This post is a very quick brain-dump of stuff I did over the weekend, in the hopes that I don’t forget it :). Will post more in-depth material if time permits over the weekend. govScan.info, a site I created as a side hobby project to track TLS implementation across .gov.my websites — now tracks DNS records as well. For now, I’m only tracking MX, NS, SOA and TXT records (mostly to check for dmarc) but I may put more record types to query. DNS Records are queried daily at 9.05pm Malaysia Time (might be a minute or two later, depending on the domain name) and will be stored indefinitely. Historical records can be queried via the API, and documentation has been updated. The security community has been abuzz with an absolutely shocker of story from Bloomberg. The piece reports that the Chinese Government had subverted the hardware supply chain of companies like Apple and Amazon, and installed a ‘tiny chip’ on motherboards manufactured by a company called Supermicro. What the chip did — or how it did ‘it’ was left mostly to the readers imagination. Supermicro’s stock price is down a whooping 50%, which goes to show just how credible Bloomberg is as a news organization. But besides the Bloomberg story and the sources (all of which are un-named), no one else has come forward with any evidence to corroborate the piece. Instead, both Apple and Amazon have vehemently denied nearly every aspect of the story — leaving us all bewildered. But Bloomberg are sticking to their guns, and they do have credibility — so let’s wait and see. For now, let’s put this in the bucket called definitely could happen, but probably didn’t happen. I can only imagine how hard it must be to secure a modern hardware supply chain, but the reason for this post is to share my experience in some supply chain conundrums that occurred to a recent project of mine. I operate (for fun) a website called GovScan.info, a python based application that scans various gov.my websites for TLS implementation (or lack thereof). Every aspect of the architecture is written in Python 3.6, including a scanning script, and multiple lambda functions that are exposed via an API, with the entirety of the code available on github. 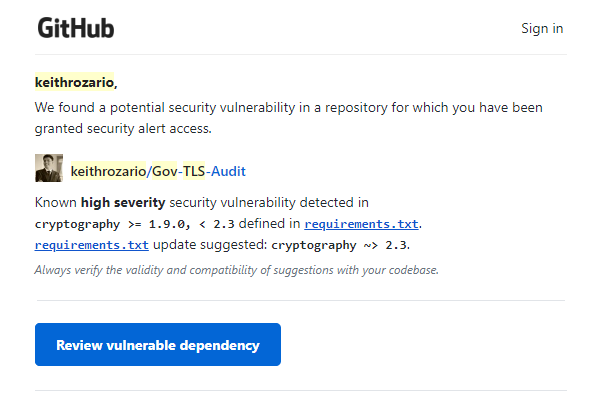 And thank God for GitHub, because in early August I got a notification from GitHub alerting me to a vulnerability in my code. But it wasn’t a vulnerability in anything I wrote — instead it was in a 3rd-party package my code depended on. From my previous post, you can see that I hosted a slide show on a subdomain on hitbgsec.keithrozario.com. The site is just a keynote presentation exported to html format, which I then hosted on an S3 bucket. The challenge I struggled with, was how to point the domain which I hosted on Cloudflare to the domain hosting the static content. The recommended way is to just create a simple CNAME entry and point it to the S3 bucket, but that didn’t work because the ‘crypto’ settings on Cloudflare apply to the entire domain — and not individual subdomains. And since my website at www.keithrozario.com had a crypto setting of ‘Full’, the regular CNAME entry kept failing. I could have downgraded to ‘Flexible’ but that would mean my blog would be downgraded as well — which wasn’t ideal. Why downgrade my main blog to accommodate a relatively unimportant sub-domain. Instead found that the solution is to overlay a CloudFront Distribution in front of S3 Bucket — and then point a CNAME entry to the Distribution. On the 20th of July, Singaporean authorities announced a data breach affecting SingHealth, the country largest healthcare group. The breach impacted 1.5 million people who had used SingHealth services over the last 3 years. Oh boy, another data breach with 1.5 million records … **yawn**. But Singapore has less than 6 million people, so it’s a BIG deal to this island I currently call home. Here’s what happened. According to the official Ministry announcement administrators discovered ‘unusual’ activity on one of their databases on 4-Jul, investigations confirmed the data breach a week later, and public announcement was made 10 days after confirmation. The official report states that “data was exfiltrated from 27 June 2018 to 4 July 2018…no further illegal exfiltration has been detected”. Boy, that’s a lot of RED! Last week, MyNic suffered a massive outage taking out any website that had a .my domain, including local banks like maybank2u.com.my and even government websites hosted on .gov.my. But this didn’t work, as the parent zone still had a DS entry that pointed to key tag:25992 and hence was still expecting DNSSEC to be turned on. 5 hours after that, they added back the missing DNSKEY key tag:25992 (oh we found it! ), but added invalid Signatures for all entries — still failing. Only 4 hours after that did they fix it, with the proper DS entry on root for DNSKEY key tag:63366and valid signatures. That’s a 24 hour outage on all .my domains. So basically, something broke, they sat on it for 15 hours, then tried a fix, didn’t work. Tried something else 5 hours after that, didn’t work again! And finally after presumably a lot of praying to the Gods of the Internet and a couple animal sacrifices, managed to fix it after a 24-hour downtime. I defend my fellow IT practitioners a lot on this blog, but this is a difficult one. Clearly this was the work of someone who didn’t know what they were doing, and refused to ask for help, instead tried one failed fix after another which made things worse. As my good friend Mark Twain would say — it’s like a Mouse trying to fix a pumpkin. I don’t fully understand DNSSEC (it’s complicated), but I’m not in charge of a TLD. It’s unacceptable that someone could screw up this badly — and for that screw up to impact so many people, and all we got was a lousy press release. The point is, it shouldn’t take 24 hours to resolve a DNSSEC issue, especially when it’s such a critical piece of infrastructure. 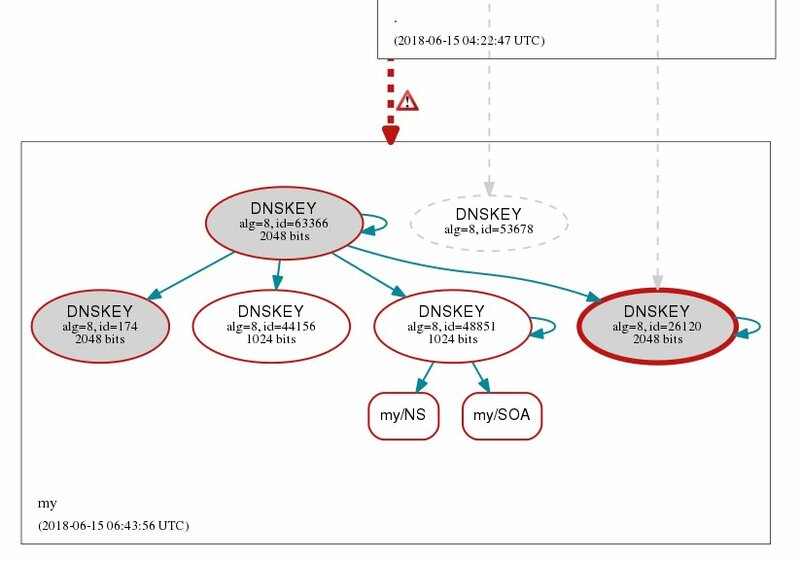 I’ve gone through reports of similar DNSSEC failures, and in most cases recovery takes 1-5 hours. The .nasa.gov TLD had a similar issue, that was resolved in an hour, very rarely do we see a 24 hour outage, so what gives? I look forward to an official report from MyNIC to our spanking new communications ministry, and for that to be shared to the public. Ok, I’ve been pretty involved in the latest data breach, so here’s my side of the story. At around 11pm last Friday, I got a query from Zurairi at The Malay Mail, asking for a second opinion on a strange email the newsdesk received from an ‘anonymous source’. The email was regular vulnerability disclosure, but one that was full of details, attached with an enormous amount of data. This wasn’t a two-liner tweet, this was a detailed email with outlined sub-sections. It covered why they were sending the email, what the vulnerable system was, how to exploit the vulnerability and finally (and most importantly!) a link to a Google Drive folder containing Gigabytes of data. The email pointed to a Ministry of Education site called SAPSNKRA, used for parents to check on their children’s exam results. Quick Google searches reveal the site had security issues in the past including one blog site advising parents to proceed past the invalid certificate warning in firefox. But let’s get back to the breach. My first reaction was to test the vulnerability, and sure enough, the site was vulnerable to SQL Injection, in exactly the manner specified by the email. So far email looked legitimate. Next, I verified the data in the Google Drive folder, by downloading the gigabytes of text files, and checking the IC Numbers of children I knew. I further cross-checked a few parents IC numbers against the electoral roll. Most children have some indicator of their fathers name embedded in their own, either through a surname or the full name of the father after the bin, binti, a/l or a/p. By keying in the fathers IC number, and cross-referencing the fathers name against what was in the breach, it was easy to see that the data was the real deal. So I called back Zurairi and confirmed to him that the data was real, and that the site should be taken offline. I also contacted a buddy of mine over at MKN, to see if he could help, and Zurairi had independently raised a ticket with MyCert (a ticket??!!) and tried to contact the Education Minister via his aide. Obviously neither Zurairi nor myself, or any of the other journalist I kept in touch with, could report on the story. The site was still vulnerable, and we didn’t want someone else breaching it. The next morning, I emailed the anonymous source and asked them to take down the Google Drive, explaining that the breach was confirmed, and people were working to take down the site. Hence there was no reason to continue exposing all of that personal information on the internet. They agreed, and wiped the drive clean, and shortly after I got confirmation that the SAPSNKRA website had been taken down. So with the site down, and the Google Drive wiped cleaned, it seemed the worst was behind us. Danger averted…at least for now. But, since Data breaches last forever, and this was a breach, we should talk about what data was in the system. Zurairi did a good job here, but here’s my more detail take on the issue.